Let the show begin! With all our reports and images of Comet ISON being in outburst, this latest image from astrophotographer Damian Peach shows just how much activity is taking place in this comet as it races towards the Sun. “Hard to believe this is the same comet in my last image of Nov 10th!” Damian said via email. 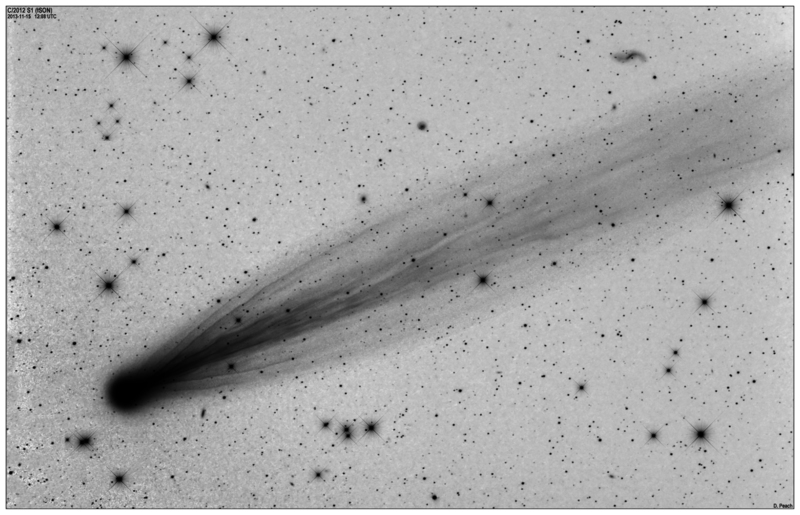 ISON’s tail is suddenly full of streamers and features not seen before in this comet. At less than two weeks to its close encounter with the Sun on November 28, only a short amount of time will tell us if Comet ISON is just beginning to show off its brightness or if it is beginning to break apart. The views here are through good quality telescopes. It is just now becoming visible to the naked eye, looking like a faint smudge at about magnitude +5.5. A widefield view of Comet ISON, taken from New Mexico Skies at 11h 59m UT on Nov. 15, 2013 using an FSQ 106 ED telescope and STL11K camera on a PME II mount. 1 x 10 min exposures. Credit and copyright: Joseph Brimacombe. A narrowfield, false color view of Comet ISON on Nov. 15, 2013, taken from New Mexico. Credit and copyright: Joseph Brimacombe. 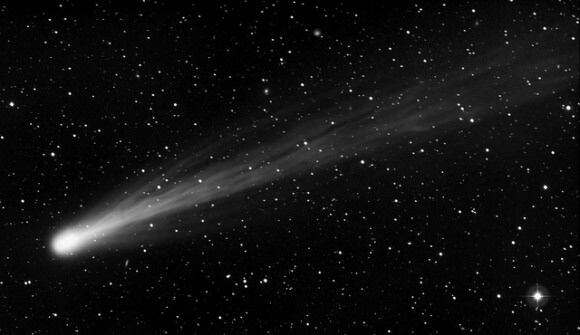 A negative image of Comet ISON on Nov. 15, 2013, 106mm F5.0 with STL-11k. LRGB. L: 5x2mins. RGB: 1x2mins. Credit and copyright: Damian Peach. Aqua Vitae. Thank you Mr Peach. B’low us, away, far far far away. These are all magnificent. I am here in Arizona stuck under massive clouds for almost a week solid now. Sniff, sniff. I’m At Dyess AFB in Abilene, TX wondering if I’ll get to see ISON. I have clear night skies right now! I am in Deming, NM, Last night I saw three shooting stars from the Leonid shower and at about 0400 MST I caught ISON through binoculars. I plan to be outside from around 0430 to sunup today if there are no clouds. Amazing what a CME will do to a comet. I am in Gaborone, Botswana (Southern Africa). What time should I stare in the skies to see ISON? Doesn’t matter where you are, the comet is currently visible in the pre-dawn sky (about 30 minutes before sunrise) though it’s quickly going to be unobservable due to its approach (angular position) to the sun. It will achieve perihelion, its closest pass to the sun, on Nov 28, passing behind it (from our perspective). After that, if it survives its close encounter with the sun and re-emerges, you’ll be able to see it in the evening after sunset. It will be at its closest to Earth (+/- 40 million miles) around Dec 26th as it heads back out of the solar system. Take a look at the great and gorgeous photos of Damian Peach , British Astro-Photographer or Chris Marriots , Sky Map Program , on the Internet. a lot to be thankful for ! Peace and Love To All .